I’m a big fan of using greetings cards as a marketing tool. I send them myself. They’re a good way to keep in touch with clients and prospects because they allow you to write a personal message that’s delivered in a format which is likely to get read. But if you’re using cards, you’ve got to mean what you say in them. I’ve been re-jigging my telecommunications arrangements recently, and as part of the changes I moved my home phone provider from one of the old-world telecom giants. Why? Because they were expensive and gave poor customer service. Nothing new there. Then this morning I received a greetings card through the mail. On the front is picture of a seesaw, with only one person on it. 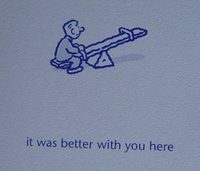 The caption: it was better with you here. "I’m writing to say that we are sorry to see you go. 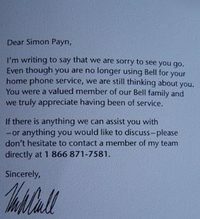 Even though you are no longer using Bell for your home phone service, we are still thinking about you. You were a valued member of our Bell family and we truly appreciated having been of service. "If there is anything we can assist you with – or anything you would like to discuss – please don’t hesitate to contact a member of my team directly at [phone number]." Then it’s signed by the President of Residential Services. Now, nice try for using a card. And a good idea to write and say how valued a customer I was. But the trouble is, if the sentiments in the card don’t match the way the company actually treats its customers, then, well, it all sounds rather hollow. Indeed, it sounds cynical. Don’t tell me you love me then treat me like trash. If you’re going to say it…then mean it, too.